Cidex Group of Companies, a real estate developer with several multi-residential projects in Calgary’s downtown area, has purchased a prime high-density development site in the Beltline neighbourhood previously owned by ATCO, RENX has learned. The 1.79-acre site was sold for $14.5 million, confirmed Kevin Morgans, principal, investment sales for Avison Young, which had the listing for the property. “They (Cidex) own a number of sites throughout the Beltline and they’re the one that’s building at 9th Avenue and 11th Street (S.W. ), the West Village towers (three towers with 554 residential units). They’re quite an active developer. . . . Only purpose-built rental,” said Morgans. In an email, Cidex said it does not have any further information to be released to the public at this time regarding the purchase. 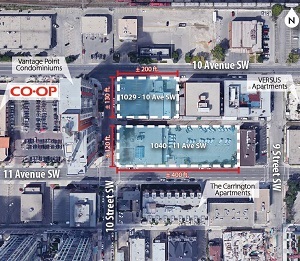 The 77,990-square-foot site includes two properties at 1029 10th Avenue S.W. and 1040 11th Avenue S.W. The property on 10th Avenue has 200 feet of frontage with a single-storey, 7,415-square-foot industrial building with 42 surface parking stalls. The property on 11th Avenue has 400 feet of frontage with a two-storey, 39,214-square-foot office building and 67 surface parking stalls. In a listing brochure by Avison Young, the 2018 assessment for the property on 10th Avenue was $9.56 million and the property on 11th Avenue was $19.09 million for a combined total of $28.65 million. “We couldn’t find any groups in our marketing process that had any interest in just using the sites for what they are today, meaning finding purpose out of the existing buildings,” said Morgans. “Ninety-nine per cent of the market was only looking at this as a redevelopment play, similar to all the condo towers you see in the area, because it is a big site. ATCO did not comment on the sale but did provide background information on the site. Before being purchased in 2016 by ATCO Real Estate Holding Ltd., the property was owned by ATCO Gas and Pipelines Ltd. The property includes a five-bay warehouse and a two-storey office building. It was used for the company’s regional gas operations. The buildings were vacant for about five years. ATCO had those buildings for more than 25 years, but sold the site because it was surplus to its operational requirements. On its website, Alberta-based ATCO says it is one of Canada’s premier corporations: “ATCO Group is a $22 billion enterprise with approximately 7,000 employees, engaged in Structures & Logistics, Electricity, Pipelines & Liquids, and Retail Energy. The former ATCO site is located between two of the Beltline’s main grocery stores with Safeway located two blocks to the east and the Co-op one block to the west. It also has easy access in and out of the Beltline and the downtown core. Morgans said the site, in addition to being close to the downtown core, is also in close proximity to the 17th Avenue entertainment district, the Kensington shopping district and other established Beltline amenities. – Hat @West Village. A large-scale mixed-use residential rental community with three towers and 554 units currently under construction. No completion date is mentioned. The project value is $350 million.